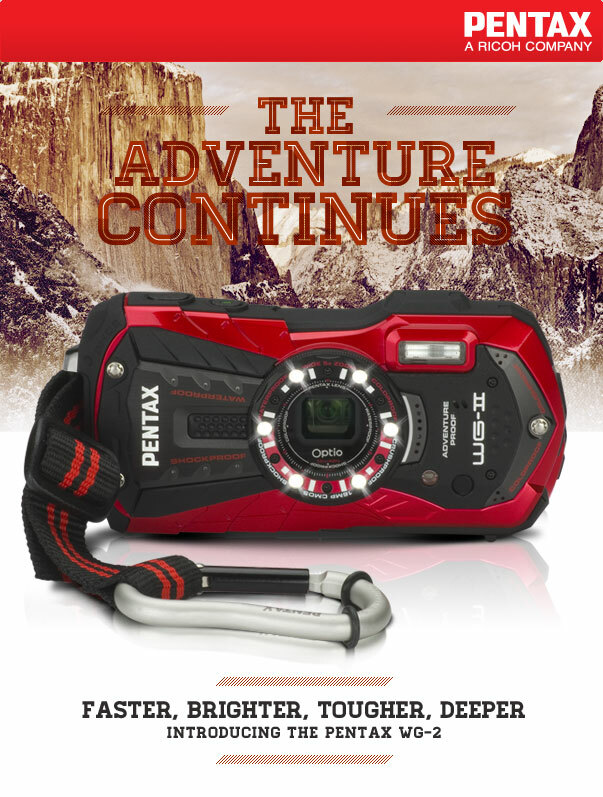 While the World marvels over Nikon’s recent announcement of the Nikon D4 and the Nikon D800, PENTAX pushes the PENTAX WG adventure camera series to the edge for the 13th time with the PENTAX Optio WG-2 digital compact camera. Waterproof to a depth of 40 feet is perfect for use when submerged in a pool, lake, or ocean, or simply when caught in a sudden downpour. Crushproof construction withstands weights up to 220 LBF (pound-force), preventing damage at the bottom of a backpack or handbag, or when accidentally wedged between a body and a solid object. Dustproof design protects the camera from dry, dusty environments from the beach to the desert. 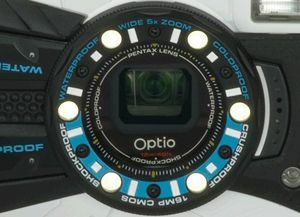 Large 3 inch LCD features a wide angle viewable HVGA resolution screen (460,000 dots), while anti-reflective coating on the screen’s protective acrylic panel greatly enhances visibility in brightly lit shooting conditions. Tough mineral crystal cover protects internal lens elements, and an easy-to-clean SP coating helps water sheet off the optical surface, minimizing blur due to water droplets. Pixel Track, Digital, and Movie Shake Reduction ensure sharp, blur-free images and video, even in dim lighting. An autofocus assist lamp helps to quickly and accurately focus, even in the most challenging of lighting conditions. Flexible multi-purpose Green Button allows for quick access to many common camera settings, including Movie Mode, Voice Recording, and other functions. Backlit 16 megapixel CMOS sensor offers superior high resolution imaging with no-compromise in image quality, color accuracy, and noise performance. 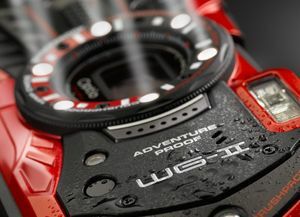 Shockproof, ruggedized design protects from drops up to 5 feet, ensuring stable operation during rigorous activity or for life’s everyday mishaps. Coldproof to sub-freezing temperatures of minus 10 degrees C (14 degrees F) is ideal for use in cold, snowy, wet conditions from skiing to snowmobiling, snowshoeing to sledding, or just building a snowman in the front yard. Wide angle 5X internal optical zoom lens (28-140mm equivalent) provides flexible capture of subjects near or far without sacrificing any bit of the camera’s rugged design. Capture full HD video in widescreen 1080p resolution (1920×1080) with efficient, high quality h.264 compression at 30 frames per second. An HDMI port (Micro, Type-D) plays back beautiful, high definition images and video on HDTVs. Capture perfect portraits with fast Face Detection technology, including Smile Capture and Blink Detection functions, as well as exposure modes specifically designed for portrait photography. Extended dynamic range functions help bring out extra detail in shadow and/or highlight areas of an image to prevent exposure clipping. Take pictures remotely using an optional PENTAX infrared remote control, perfect for self-portraits or group shots, small subject photography, or rock steady exposures. This entry was posted in Brand: Pentax, Photography Articles & Videos, Uncategorized and tagged Pentax. Bookmark the permalink.